Smithfield Foods Presents a $30,000 Donation to Sponsor Scholarships for Students Who Demonstrated Exemplary Environmental Stewardship During the National Conservation Foundation’s (NCF) 2018 International Envirothon Competition. SMITHFIELD, Va, Aug. 06 /CSRwire/ - Smithfield Foods, Inc., announced its donation of scholarship awards for the National Conservation Foundation’s (NCF) 2018 International Envirothon Competition where 250 high school students compete in teams to demonstrate their environmental knowledge and problem-solving skills. The 2018 NCF Envirothon is the final round of an environmental education program and competition that attracts more than 50,000 high school students across the U.S., Canada, and China annually. In teams, students competed in hands-on and in-class activities to demonstrate knowledge of soils and land use, aquatic ecology, forestry, wildlife, and current environmental issues during regional and statewide competitions leading into the national event. 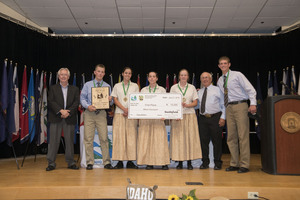 The winning teams progressed to the 2018 NCF Envirothon Competetion, which took place July 22 through July 28 in Pocatello, Idaho. Smithfield Foods awarded scholarships to the top three teams, totaling $30,000, during the competition’s awards presentation ceremony on July 27. In addition to financial support for scholarships, Smithfield employees donated their time and expertise to the program. During the regional, statewide, and national competitions, Smithfield employees served as volunteer advisors to lead training sessions, facilitate program curriculum, and coordinate activities. Smithfield’s industry-leading sustainability program is focused on five pillars: Animal Care, Environment, Food Safety and Quality, Helping Communities, and People. The company actively supports NCF and its efforts to advance environmental education, aligning with both Smithfield’s environmental initiatives and its commitment to support the vitality of local communities through education. For more information about Smithfield’s sustainability program, recent achievements, and industry-leading environmental programs, visit Smithfield’s most recent Sustainability Report available HERE. Smithfield Foods is a $15 billion global food company and the world's largest pork processor and hog producer. In the United States, the company is also the leader in numerous packaged meats categories with popular brands including Smithfield®, Eckrich®, Nathan's Famous®, Farmland®, Armour®, Farmer John®, Kretschmar®, John Morrell®, Cook's®, Gwaltney®, Carando®, Margherita®, Curly's®, Healthy Ones®, Morliny®, Krakus® and Berlinki®. Smithfield Foods is committed to providing good food in a responsible way and maintains robust animal care, community involvement, employee safety, environmental and food safety and quality programs. For more information, visit www.smithfieldfoods.com. For more information, visit www.smithfieldfoods.com, and connect with us on Facebook, Twitter and LinkedIn. NCF-Envirothon is a hands-on, environmental problem-solving, leadership development program that includes a competition involving high school students annually throughout North America. Participating teams complete training and testing in five natural resource categories: soils/land use, aquatic ecology, forestry, wildlife and current environmental issues. The program combines in-class curriculum and hands-on field experiences to provide a natural resources encounter for students. NCF-Envirothon works in partnership with local conservation districts, and their state associations, forestry associations, educators, school officials, and cooperating natural resources agencies to organize and conduct competitions on the local, regional, state and/or provincial level. Winning teams from each state and province advance to a final competition for the opportunity to compete for recognition, scholarships and prizes as well as an understanding of natural resources issues. For more information on this exciting program visit www.envirothon.org.